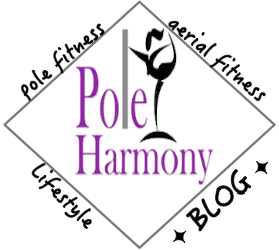 Pole Harmony: What to Expect in a Pole Dancing Fitness Class! I've seen a couple recent blog posts where students or instructors have been writing about what to expect during a pole dancing fitness class in order to offer a perspective towards potential students that may be apprehensive about signing up for their first class. I thought this was a great idea to shed some light on what could be a critical decision towards walking through those studio doors. Obviously every studio will differ on the process and how they teach their classes. This is just a summary of your experience if you are coming to take an introductory class at Pole Harmony. Moving on, after you have clicked the "Book" button for the Pole Discovery intro class on our schedule page and completed payment (if you'd like to pay cash, email us your first and last name with the date and time of the class you want to take and we will enter you into the system reserving your spot in class), you now will need to plan your attire for your first class. What to wear. For your first class, we recommend wearing a comfortable t-shirt/tank, yoga pants/capris, or shorts. Footwear is optional and limited to dance approved foot protectors, socks, or gym shoes. It is recommended students attend classes bare feet. Certain moves may require extra mobility and students may want to bring a pair of socks to protect feet. Please refrain from wearing lotions or oils on your skin as well as strong fragrances and perfumes. Most of our students wear socks in classes as hardwood floors and bare feet don't always feel so great the next day. I like to wear ballet flats. I actually purchased a great pair of flats from Kinney Dancewear in Broadripple for $18.50- they're black leather Blochs that are really comfortable. I used to have a pair of canvas ballet flats that were light pink but they always looked dirty and the canvas wore holes in them, hence the reason why my most recent purchase was leather flats. Now that we've established what to wear- let's get to the actual class! You'll want to arrive a few minutes early to complete a waiver and any pending payments. Class will begin with a head to toe warmup followed by the class curriculum. Classes will always end with an five to eight minute cool down session. The bulk of the class consists of the curriculum which includes proper postural form and pole technique, discretionary movement, fundamental skills of flow, fun moves facing the pole that can be easily brought home for practice, and an easy beginner level spin. Moves are modified for every body shape and size in addition to physical limitations. to benefit the most from the curriculum. We hope this article was full of information that answered many of your questions. If you have any additional questions regarding our classes or studio, please visit our website Frequently Asked Questions or contact us via email or phone.